The Burning Trail is a room in the Magmoor Caverns. 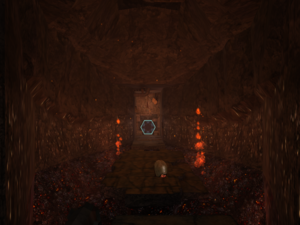 The room is first accessed from the Transport to Chozo Ruins North, and leads to the Lake Tunnel. There is also a side door to Save Station Magmoor A. The first part of the room is a tall shaft with moving platforms on the walls that can be used to climb it, but Samus starts at the top. The room then turns into a small hallway that makes a small turn but then resumes its previous direction. A number of Shriekbats hang from the ceiling. At the end of this small hallway, it opens up to a small room that consists of a small island surrounded by lava. There is a Grizby on this platform.